While modern-day Australia might have started life as a British prison colony, it has evolved into one of the world's premier tourist destinations. Visitors to Australia will delight in its exciting, cosmopolitan cities, fantastic weather and famously beautiful coastline, as well as the friendly nature of the locals that they encounter. Australia - a country and continent in one - is the world's sixth-largest nation by land area, and has a wealth of natural attractions begging to be explored. From the monolithic rock at Uluru; to the wild, untamed and unforgiving Outback; to the colourful wonder of the Great Barrier Reef off Queensland's sun-soaked Gold Coast, Australia possesses some unique and unforgettable sights. Active types will love Australia's 'outdoors culture', and a huge array of sports and activities, including swimming, diving, snorkelling, surfing, bush walking, hiking, mountain biking and even skiing, are popular with locals and available to tourists. For those who prefer to keep their holidays urban, Australia's cities will certainly not disappoint. Clean, cosmopolitan and youthful, Australia's urban centres (including Sydney, Brisbane, and Melbourne) are world-class. Famous cultural attractions in Australia include the Sydney Opera House and Harbour Bridge, the Australian Museum and the Museum of Old and New Art (MONA). Australia also boasts an impressive and fast-moving restaurant culture, guaranteed to satisfy even the fussiest gastronomes. Whether you schedule a lot of sightseeing in Australia, or plan to spend most of your time relaxing on the great beaches and sampling some of the local beer (of which there are many brands), you are bound to have a splendid time in the Land Down Under. Due to the mild, temperate climate of Australia, there is really no bad time to visit - even in mid-winter (June), the mercury regularly climbs to 68°F (20°C). However, the best time to visit Australia is definitely during the summer (December to March), as not only is the weather sublimely hot and sunny, more events and festivals take place, and a generally more festive atmosphere fills the streets. More info on Australia's Climate and Weather. -The Sydney Opera House is an iconic triumph of architectural design, and boasts a top-quality programme of shows and events. -The Australian Museum is a fascinating place to visit, and caters wonderfully for kids. -Embark on the adventure of a lifetime, and travel into the Outback to see Uluru (formerly known as Ayer's Rock) a giant monolithic rock, considered sacred by Australia's Aboriginal population. -Tasmania's Museum of Old and New Art (MONA), opened by millionaire private collector David Walsh, is causing quite a stir in the art world. 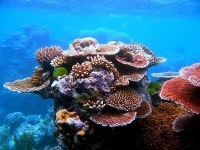 -Get your snorkel gear out, and go see the Great Barrier Reef up close. The beauty of the brightly-coloured coral reef, the largest living organism in the world, will not soon be forgotten. -Swim, learn to surf, or else just chill out on Queensland's Gold Coast - home to some of the very best beaches in the world. -See a cricket match at one of the country's legendary stadia (the Melbourne Cricket Ground is highly recommended). -Take an early morning hot-air balloon ride over the Australian Outback, and marvel at the beauty of the severe and sparse expanse, stretching in every direction with no sign of human settlement. There are cheap direct and indirect flights to Australia available from the United Kingdom and the United States. The most popular entry-points into Australia are Melbourne-Tullamarine Airport and Sydney Airport. Voss by Patrick White, Oscar and Lucinda by Peter Carey, In a Sunburned Country by Bill Bryson, and Red Dog by Louis de Bernières. Kylie Minogue, Nick Cave, and AC/DC. Shine (1996), The Castle (1997), The Adventures of Priscilla, Queen of the Desert (1994), Australia (2008), and Rabbit-Proof Fence (2002). Local beer like Victoria Bitter, Tooheys and XXXX (said 'four ex'). Vegemite on toast and barbeque. Great souvenirs to buy in Australia include boomerangs, beer cosys, wine and Aboriginal folk-art. Be sure to pack a swimming costume, plenty of sunscreen, lightweight clothing (if travelling in summer), and at least one pair of good walking shoes, as you are sure to want to explore the country's wonderful natural landscapes. The Sydney Film Festival, one of the longest-running and most revered film festivals on the planet, takes place each year in June. The Big Day Out rock concert series, with shows in all of Australia's major cities, ensures that summertime in Australia is a hip and happening affair. The Melbourne International Arts Festival (October) boasts a fantastic programme of (mainly free) dance, theatre, music, opera and visual arts performances. Australia Day (26th of January) is celebrated with tremendous gusto right across the country. -Australia is one of the least densely populated countries on earth, with about three people for every square kilometre. -Australia's first police force was composed of the most well-behaved convicts. -More than 85 percent of Australians live within 31 miles (50km) of the coast. With cosmopolitan cities spread across the vast unforgiving bush and a lively and welcoming population, Australia is a fascinating travel destination for just about anyone.